Summer Glau's western The Legend of Hell’s Gate will be shown Friday April 1th at 7:00 pm and Thursday April 7th at 10:00 pm. I updated the news post but people who read the forum might miss that. Little is known about Summer Glau role in this movie she plays Maggie Moon, a member of a family that the outlaws encounter. It sounds like she is playing a small role in this movie. If you look at the movie poster and the credit on it, she has the same weight as the other actors; but the trailer don't show her too much. You are right, but they had a homepage (been taken down a couple of months ago) where the intro only featured the the outlaws. Beside Summer, Eric Balfour is the only actor of the movie i know of. He made a scifi (alien invasion) movie in November, Skyline. The movie production buget was $10 miilions and the worwide total grosses was $65 millions. 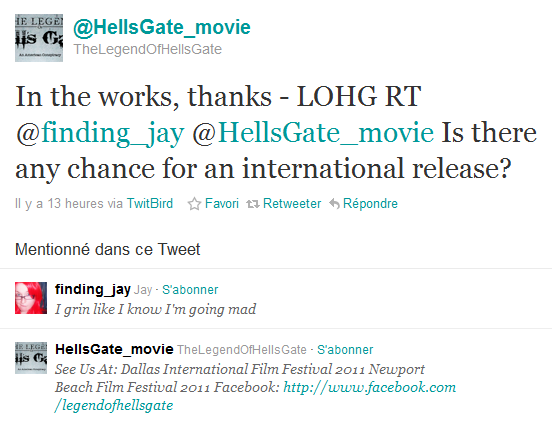 Even if it was not a hit and critics didn't like it, it was profitable; i think this is an element that weights in favor of a theatrical release of The Legend of Hell’s Gate. I don't think it would be enough though. Here is a screencap of the tweet : Beside Summer, Eric Balfour is the only actor of the movie i know of. He made a scifi (alien invasion) movie in November, Skyline. The movie production buget was $10 miilions and the worwide total grosses was $65 millions. 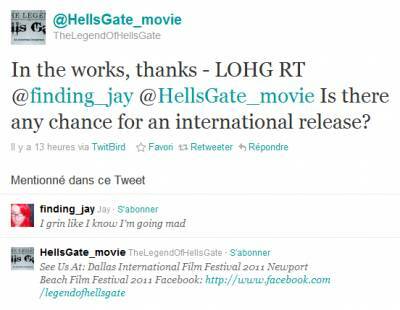 Even if it was not a hit and critics didn't like it, it was profitable; i think this is an element that weights in favor of a theatrical release of The Legend of Hell’s Gate. I don't think it would be enough though. The actor that played Elsworth in Deadwood is in the trailer, Jim Beaver iirrc. He's a good actor. And I have seen one of the main actors in a ton of things, the role that comes to mind is the jerk boyfriend to Claire in Six Feet Under. A great show and he gave a great performance. I hope the movie is good. It looks cool. was there not a pic or a clip that showed her as she got her chance to try ride a pony or horse(thinking of some clip about Firefly/Serenity where she says she was a little disapointed she did not get to try ride a horse. Does that that mean we will see Summer ? I hope so but we don't know if she is going. It is the premier of her movie, I think that it is very likely she is attending. DIFF REVIEW: ‘The Legends Of Hell’s Gate: An American Conspiracy’. History isn’t a bore; some filmmakers just craft it that way. Luckily, it seems director Tanner Beard made a historical film the way he wanted to – tightly-contained, shot beautifully and packed with name talent, clearly having some fun. And that makes all the difference.